What sort of MOOCs would emerge in the coming future? Thanks jenny for sharing her views and experience in her post here on OLDSMOOC. I am interested in knowing the OLDSMOOC though won’t be working on a project. I think we have now come up with a gap in between c and x MOOCs as it seems that they are coming from two different universes. The prescribed and emergent learning in any course could be charted out, as this footprints of emergence have delineated. The reality is that there isn’t enough connection (or conduit) in between the two sort of MOOCs, leading to “island” of technology automation (where one is teacher-centred, and the other more inclined to be learner-centred). The reason that I bring this out is that this could be confusing for the participants of the MOOC, in particular the educators if they don’t have a thorough understanding of the pedagogy and curriculum design of the MOOCs. Currently, it seems obvious that most, if not all xMOOCs (i.e. 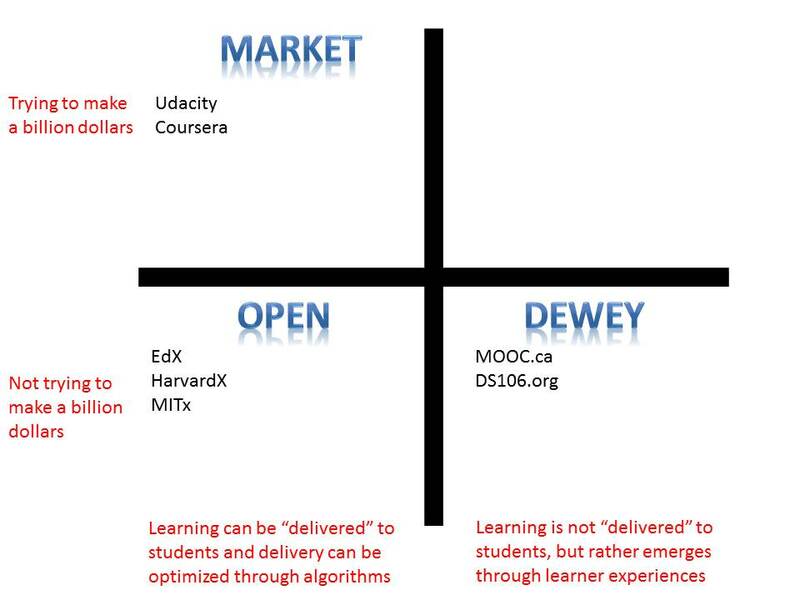 Coursera, edX, Udacity) are based on an instructivist approach, whilst cMOOCs are based on a connectivist approach. There are certain MOOCs which seem to be based on an instructivist/constructivist approach. The challenge is: we don’t seem to be guided by a thorough research paradigm which is empirically based, when developing these MOOCs along those lines, as I have suggested in my research proposal here. I am re-posting here for reference. I need to think more about the above, whether my assumptions about both intrinsic and extrinsic motivation will affect how people face challenges, technology and connecting / relating to others. The above statements are just set to be a “polarised” one, and these are just my first thoughts. I need to draw a mind map to show the relationship at a later stage, once I have re-visited our research papers on Blogs and Forums as Communication and Learning Tools in a MOOC and The Ideals and Reality of Participating in a MOOC. If you felt comfortable with idea, it may be fun to collaborate together using a shared workspace for mind / concept map or drawing tool. Besides, there are many other factors and concepts on learning that need to be included in this research. I think it could be interesting to conduct research on PLENK2010 based on our experience and involvement in CCK08/CCK09/edfutures/CritLit2010. I am not sure if we could thresh out some research questions, as a follow up study of CCK08. 2. What are the delivery factors in an open online course? 3. How would educators and participants evaluate an open online course (PLENK2010)? I think the future MOOCs would likely be based on connected MOOCs, with some common features of both x and c MOOCs in order to thrive, though we have an urgent need to conduct further research to validate those hypothesis and assumptions. Here is my first post in 2013. Happy New Year. There is an interesting post followed with a conversation on the Guide to 4 complex learning theories on FB, referred by Grainne Conole. 1. Is the learning theorists for George Siemens with a basis include Vygotsky, Papert Clark and Social Constructivism? I found some similarities and differences between Connectivism and Social Constructivism, as I shared in my blog posts here and here. 3. 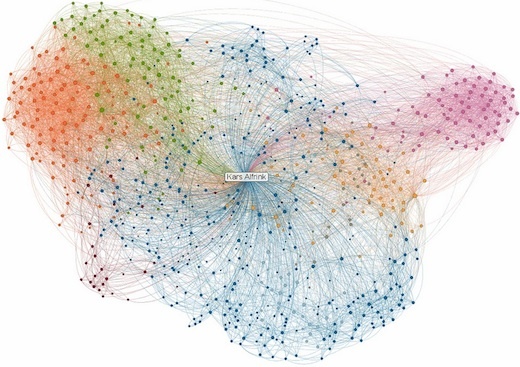 Influencing factors – diversity of network. How about the strengths, types (openness), technological impact, and uniqueness (autonomy) of networks? 4. How transfer occurs – connecting to (adding nodes). There are many ways of connecting, and disconnecting (including filtering unwanted noise or distractions), and re-connecting, and the concept of connection could be at a micro and macro level. 5. Type of learning best explained – complex learning, rapid changing core, diverse knowledge sources. Upon closer examination, the type of learning would be based on the assumptions of learning. What is “best” explained? 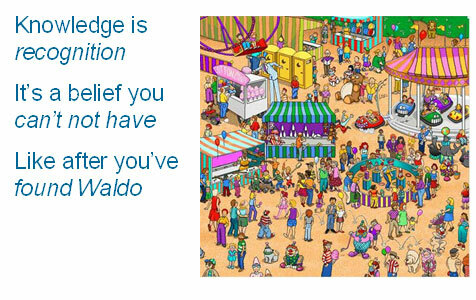 What sort of assumptions are made in classifying certain scenarios as complex learning? Here we might have to note whether we are referring to open or closed learning environment. Even in the case of closed learning environment, there could be complex learning when learners and agents interact and form connections in complex manners. Hi Martyn Cooper, I think the Laurillard Conversational model is very useful in the case of “formal learning scenario”, especially under a “closed educational learning environment” where a teacher-student transactional model is defined. I have quoted that in my blog post too. What would happen if the student becomes a teacher, and interacts with different sources (i.e. agents, information sources, and networks) and posts and shares his/her knowledge with others in the public and open space. He or she may be playing the role of both a teacher and student (a dual role), and could be internalizing the knowledge (the tacit knowledge) in particular, when reflecting on certain experiences. So, the Conversational model could be both socially oriented (with an external agent, a teacher or peer), and also internally initiated (with oneself, or with an artifact, such as writings or pictures, etc.). There are again certain assumptions here on learning, where I have briefly summarised under the Assumptions Theory. In summary, I am not sure if Laurillard Conversational model could be extended to include the internal conversation, as it seems to relate mainly to the social constructivist model of learning. What do you think Grainne Conole and Martyn Cooper? I am interested in the Learning Design of MOOC, as I have posted here. I still haven’t been able to conclude what would be the most valuable one – based on x and c MOOCs, as they seem to address different cohorts of learners, though there are always common principles which would give rise to great learning experience in MOOC. Relating to OLDS MOOC, Jenny asks how much prescription is needed to facilitate emergent learning, or indeed, any learning. If the designer’s intentions and learner experience are not aligned, then the learner’s experience could still be validated based on an emergent approach – for instance, by suggesting learner to document and reflect on their learning using their own set of curriculum, and developed criteria for assessments. This is actually the case for some of the learning for PhD’s students, whereas they are expected to explore the forefront of knowledge and create their own space, and thus develop new knowledge that could contribute to their specialised domain. Other ways for validation includes the commenting and reflection on each others’ blog posts, collaboration with others in communities and networks, cooperation with others in joint writings on wikis or research, leading to the publication of research papers, just like what some of the participants of MOOCs have done in the past. The use of e-portfolio and PLE are also good means for self-assessment, which could be validated by the learner’s immediate mentor or coach on an ongoing basis, rather than the course instructor or professor. This would likely address the alignment issue in a totally different way though some of the above approaches might need to be developed and documented using a social contract or agreement, in order to ensure openness and transparency is maintained. The validity, authenticity, reliability and fairness issues relating to the evidences collected in such assessment would also need to be thoroughly examined and addressed in such a course, in an ongoing basis, in order to cater for the emergent learning that evolved. My response is: If we are to structure a MOOC based on self-directed learning and self-organised learning, with an ultimate goal of supporting learners in sense-making and way-finding, then learner experience must be catered for in such a course, in order to continue in supporting the learner’s learning. This is similar to the principles of Ergonomics, whereas we should be designing the machines, environment to suit individuals, rather than re-molding or changing the individuals to suit the machines or environment. It would take another post to elaborate on this important learning principle. Hi Jenny, Well said, and a great summary. I watched the videos, and reflected on them in my blog too, though I related to my experience in a slightly different way – on landscape of practice. What I would like to add is Dave Snowden’s views about emergent learning, based on his model of Cynefin (see this http://www.youtube.com/watch?v=N7oz366X0-8). Scientific approach to teaching I have been wondering what theories would change the world. Social Constructivism, Cognitivism, and Behaviorism have both shaped and changed the world to a certain extent. Connectivism, a new and emergent learning theory has come along the centre stage and significantly influenced the way we educate and learn, using networks and tools. How about Assumptions Theory that I have postulated? “7 assumptions I think have to remain true for the university model to continue as it currently is. The perception of most people will still be that it is worth it to get into huge debt in order to get a university degree. The perception of most people will still be that the best way to get a university degree is by physically attending a college. The perception of most people will still be that if you want to learn something, you must go to a school. The students raised in the Internet age will still accept that the best way to learn is still mass lecturing. Businesses will continue to rely on a university degree as a signaling mechanism for employment. The intention of this paper is (a) to identify the assumptions of the open scholarship movement and (b) to highlight challenges associated with the movement’s aspirations of broadening access to education and knowledge. The goal of this paper is not to frame open scholarship as a problematic alternative to the status quo. Instead, as we see individuals, institutions, and organizations embrace openness, we have observed a parallel lack of critique of open educational practices. We find that such critiques are largely absent from the educational technology field, as members of the field tend to focus on the promises of educational technologies, rarely pausing to critique its assumptions. To me, the assumptions behind open scholarship movement have hinted the move made by professors, scholars and researchers, institutions and organizations in charting out their own directions of developing and practising open scholarship. These open educational practice is now manifested either under an institutional framework, or merely on individual created framework. This set the precedence of exploring with experimentation and entrepreneurship at the extraordinary scale with technology affordance – MOOCs and/or social network platforms and tools. Though no one has rightly predicted the outcome of such movement, it seems these complex and evolving “strange attractors” would always interact and generate another set of disruptions that cause the education to change its direction. Will technology change the world? Definitely, as we have seen how computers, internet and world wide webs have actually transformed the world. For in under a year, the rise of the MOOCs (massively open online courses) has fundamentally reshaped how we think and talk about teaching and learning in higher education. MOOCs have become the darlings of the educational policy world: they have been cited as the solution to the college debt crisis, as the future of higher education, as the best way to make higher education more productive, and at the center of the recent intrigues at the University of Virginia that almost toppled its president. What have we assumed here? MOOC could revolutionise conventional higher education (by the universities and tertiary institutions), through the introduction of massive education, as these courses are open, free for all to join and participate, and most importantly more cost effective in providing high quality higher education. Another set of assumptions relate to their extensive use of professors and technology to build up the “just in case education scenarios” as there are more demands than the supply currently available for higher education – degrees and diplomas offered by the universities. Other assumptions are based on the premises that mass lecturing is no longer that effective. Lecturing (mass lecturing in particular) has been hailed as the effective way to transmit information, based on the assumption of scarcity of information and professors and educators. Half of all faculty do nothing but lecture in all or most of their classes; and what they lecture about is usually at the very bottom of Bloom’s Taxonomy, focusing on factual recall rather than critical analysis, synthesis or application; and that knowledge is itself barely absorbed by students for more than a semester. Sometimes I half-wonder, in those long moments of the night, whether it might be better if we were indeed replaced. In MOOCs, there are now so many professors coming forth to the centre stage that it seems to become the next grand “show business” where educators and professors are all “educating” the tens of thousands of MOOCs participants through their video performance. Every single MOOC professor has to present herself or himself in front of the “camera”, or the web cams, in order to get the attention from their potential “students”. TED talks have become the test beds for more and more speakers (educators, entertainers, designers, professors etc.) to both practise and showcase their expertise to the world. This is again unprecedented as the presenters, professors, educators and even students are competing against both time and space in order to “teach” the world. Youtube, Blip.tv, provide ample spaces for such creators to post their videos. Our assumption here is: videos are ubiquitous, and there are abundant videos for use in open education. The reality is: The quality and value of those “education videos” are yet to be evaluated, as many videos might just be memes, or entertainment videos. Is Gangnam style one of that type of entertainment video/meme? It may be just a fad, though an important one in 2012 that has broken all records in Youtube, in terms of number of hits. Massive number of hits is what advertisement counts, and what education with the media wants. If one could achieve fame and get all the attention from the media, could education based on a remix, repurpose, and recreate also achieve that same purpose – of educating the mass population through such a means? Or may be the current xMOOCs are doing exactly what it is trying to achieve. What theory would likely be able to describe the current MOOCs movement? How about the Just in case versus Just in time learning scenario? To me, xMOOCs relate more to just in case education and learning, whilst cMOOCs relate more to just in time education and learning scenarios, though there could also be a hybrid of the just in case & just in time all blended in x or c MOOCs. What are the assumptions behind teaching based on a scientific approach? Are we racing with time and space and competing with the education and learning chains in this education mania? MOOC mania in particular! I will continue to reflect in the Part 2 of this series. We have more assumptions to make, to chart out the future of higher education. Why are there so few researches done on MOOCs? What are the challenges in conducting researches into MOOCs? These are just 4 illustrations that exemplify some important issues in online education today. Academic papers whose references are based on blogs and newspaper articles. Numbers quoted by newspapers and blogs that can be totally misleading. More precise information from learning analytics and more published research are needed. Since the average time it takes for a research paper to get published in a peer reviewed journal is around 4 months, when they do appear they are most probably obsolete.Research in online education needs to change its publishing methodology to a more dynamic format. (If interested in this particular point I have discussed it in more detail in a previous blog post (Rodriguez 2012)). If you were to write a research paper based on such postings, isn’t it perfect to say xMOOCs provide great learning experience for the learners? To what extent are such claims applicable to all participants? Most MOOC participants to a survey research would likely do the same, by providing valuable and honest feedback about the course design and delivery. However, what are the presumptions here? Those who like the MOOCs would post their comments on the discussion board. Those who don’t wouldn’t even bother to comment. May be, or may be not? 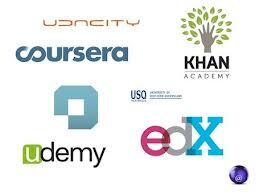 How about the views and experiences of other educators, professors of these MOOCs? You would find a lot in the blog posts, where praises and criticisms are all nuanced or mixed, using the sandwich approach, in order to show an “appreciation” of MOOCs. If we were to evaluate MOOCs for xMOOCs based on Mastery Learning as a pedagogy, then we would likely come up with the conclusion that Mastery Learning is a perfect way to teach and learn, as the assumptions behind such pedagogy are “proven” based on “facts” and “praises” by the learners, likely those who successfully achieved mastery through learning with the course. What about those participants (or researchers) who prefer to learn with other pedagogy, likely due to their different “schools” of thoughts? For instance, those who learn through a connectivist or constructivist approaches towards learning, where learning is based on Connectivism, or Constructivism, and Social Constructivism. Would these participants come up with the same or similar evaluation of the course and the presenter(s)? 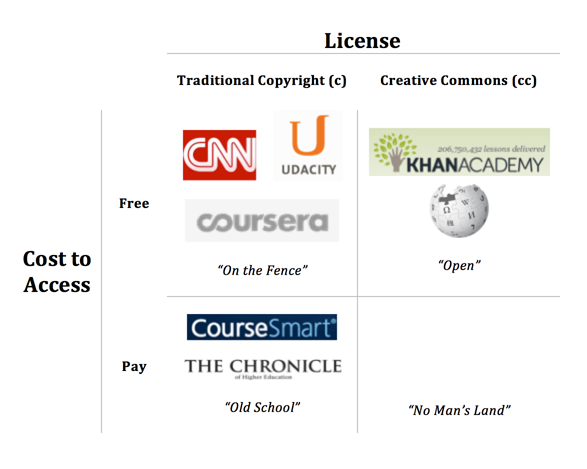 There are many assumptions behind such nuances and differences in views of the MOOCs. The strong criticisms on both sides of the MOOCs are evident, from both educators and participants. 3. Who are conducting the researches on MOOCs? Would that make a difference in the research findings and conclusion? Would the research studies be coming out from researchers, academics, scholars, or students? It’s likely that each groups of researchers would look at MOOCs from different angles, perspectives, even with the findings pretty much similar, through research studies. This has been revealed through many researches, where participants continued to praise the MOOCs. The challenge is: would researchers be able to disclose any “negative” or “not so positive comments” about the courses? These are sensitive issues that are bound by research ethics and confidentiality protocols, that none of these comments would be named, and so they remained anonymous. To what extent would researchers disclose such remarks in their research papers? How would that type of research findings add value to the research, and respond to the research questions? 4. How would research into MOOCs be funded and supported? Who would fund such researches in MOOCs? I have worked with Jenny Mackness, Roy Williams, Rita Kop, and Helene Fournier in research into MOOCs, and none of them were funded by institutions. I found such researches both interesting and challenging, mainly because research done on a “personal basis” would only be “recognised” by oneself, and organisation so far if it adds value to them. We need partners who would be willing to collaborate with each others, and more importantly willing to open up each other’s minds, in the design and development of research tools and methods which work. Research into MOOCs is an emerging and evolving practice, and so the publication of paper is just one part of the whole story. Research into MOOCs also needs to take into considerations the protocols of academic research, where researchers need to understand their roles and responsibility to each others, and to the community that they are associated with, in this case the MOOCs.